Well done to all who completed one of our races. We hope all 10k and 5k runners enjoyed that last long haul, which is Hobs Hole Lane - did you spot our little hobgoblins cheering you on up the hill? The origin of the name 'Hobs Hole Lane' comes from 'hobgoblin'. The 10k race was sold out before race day and 440 runners completed the race. Results for the 10k are published here. ​Click here for information about the 5k race and here for information about our Children's races. We were pleased to have both Brian Smith and our own Ron Reynolds (right) taking photographs. Brian's album can be found here and Ron's here. If you have a photo you'd like to add to this page, please email it, along with a suitable caption. 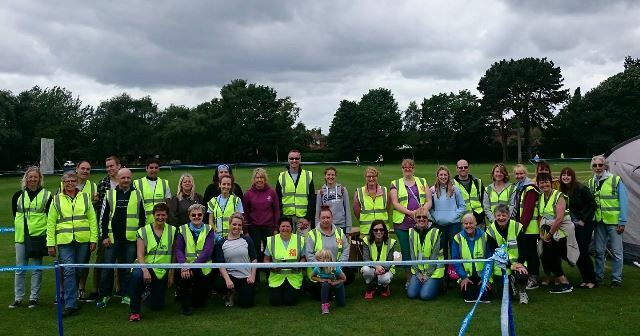 Aldridge Running Club are proud to continue the tradition of covering all volunteer positions through club members, who do not participate in the race, choosing instead to ensure the safety and success of the race, cheering and encourage others. Well done all. However, we did run our own races on Tuesday 12th, which were hotly contested with 10k winners Leigh Ally and Louise Booker.